NPR radio host Alec Siegel: Now, there is word today that a Liberian doctor who was infected and who was given the experimental treatment serum ZMapp has died. Is that right? NPR field reporter Nurith Aizenman: Yes. And on top of that, a British doctor working in a government-run Ebola care center in Sierra Leone has tested positive. He's been evacuated to the U.K. And then another health worker from Senegal who was working at a different facility in Sierra Leone now has Ebola. He was employed by the World Health Organization. They're working on getting him to another country for care. Given that the AP included this information today, perhaps it was just that the journalists didn't have access to his name, although I can't recall a moment when we didn't know the names of Kent Brantly and Nancy Writebol, the doctor and nurse from the US who had become infected with Ebola. Their names were plastered on every news piece about Ebola in the first week of August. The Liberian doctor's identity has hardly invited concern, similar to the coverage of Dr. Sheik Umar Khan, whose death merited less coverage than a discussion about the ethics of giving him ZMapp. The Liberian doctor's name was Abraham Borbor. I knew him personally and admired him greatly. I came to Monrovia last November to spend a few weeks with the internal medicine residents at John F. Kennedy Medical Center. The Liberian medical community, piecing itself back together after two decades of a savage civil war, had re-opened its medical school a few years before, and now they were taking the next step by forming a graduate training program. A colleague of mine in pediatrics had been going back and forth for several years, and asked if I'd be interested in going. I jumped at the chance. It is not often one is able to see a profession at its inception, much less play a small role in fostering it, but through sheer good luck I happened to be at JFK just as the residents were in their first month of training. I was expected to give some lectures devoted to infectious disease topics, knowing nothing about what these residents did or didn't know. I gave it my best shot. Sometimes I wildly overestimated what they knew: as a side moment in the middle of a lecture about immunity, I asked them if they understood Toll-like receptors, and got blank stares. (Suffice it to say that knowledge of TLRs is very, very much a nicety in Liberian medicine, and not of much practical use. It was about then that I realized I needed to tailor my lectures to my audience mighty fast.) At other times I had to come to grips with my own ignorance of what constituted common pathology in a place like Liberia. Here in the US, the condition of bronchiectasis is mostly limited to patients with Cystic Fibrosis, treated with repeated courses of antibiotics, and its progression is followed by serial Cat scans; there the diagnosis is made by taking a whiff of putrid breath from someone with a chronic productive cough. Throughout my brief stint there, my host was Dr. Borbor. I can't speak to his impression of me, but I liked him from the start. He was smart and funny, in his element during morning rounds when teaching his interns and residents. It took me time to size up some of the trainees owing to culture shock, but by the end of the first week it was clear to me which of the housestaff Dr. Borbor thought had real potential, and it was equally clear that his appraisals were unsentimental and reflected high standards. 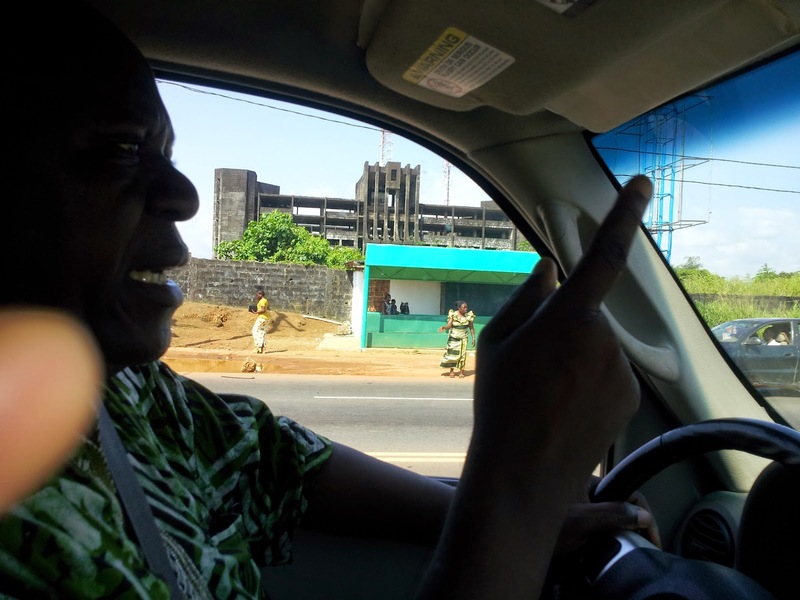 I have only one picture of him, taken in a car when we were driving around Greater Monrovia so I could get a feel for the place outside the walled compound of JFK. This picture was taken of an old Ministry building (Health? Defense? I can't now recall). A good portion of the driving that day was done in the West Point neighborhood that has become representative of the threats and challenges that this epidemic poses to Liberia, and the rest of the world should it get outside of West Africa. The conversation that day centered around the challenges of not merely providing medical care in such a resource-limited place, but simply living in such an environment. Ebola is only the most extreme example of the hurdles that people in West Point must face in order to live, work, and love just like anyone else in the world wants to do. We spent a good amount of time talking about how such a neighborhood gets power (the quick answer: pirated from transmission wires and then "sold" by the owners of the pirated lines; families who consider purchasing such power think in terms of whether they can afford to have a single light bulb on in the evenings). In these conversations, I came to see that Dr. Borbor had a considerable grasp of problems well beyond medicine that his country faced, and somehow he not only remained undaunted by political and economic difficulties that most of us would consider hopeless, but he maintained a sense of humor as well. All of this is to give you a sense of the man that I came to know and appreciate, and was hoping to meet again soon, but that's not the most important point to know about Abraham Borbor. What is critical to know about him, as well as his colleague, Dr. Samuel Brisbane, who also died of Ebola one month ago, is that these men formed the backbone of Liberian medicine. (Dr. Brisbane was out of the country most of the time I was there and so my meetings with him were brief.) Both of these doctors had somehow managed to not only stay alive during the civil war, when scores of their comrades either were killed or fled, but they stayed at their posts, continuing to care for patients when a place like JFK had no supplies or anything resembling what we would think of as the infrastructure required to run a hospital. Basically, they had a building, and they had their wits. And Dr. Borbor didn't leave, even though he was among the rare Liberians who had enough means and connections that he could have done so. There aren't words for that level of dedication. At JFK, which prior to the outbreak was regarded as the central teaching hospital for all of Liberia, Drs. Borbor and Brisbane were the department of internal medicine. If tomorrow I were to be killed in a car accident, whatever the personal loss my death would be to family and friends, in professional terms my absence would hardly register as a blip in American medicine. There are twenty trained specialists who are capable of doing what I do on a daily basis just at my institution, and there are at least a half-dozen other infectious disease doctors also working in the area, either in private practice or at the other major hospital across town. And these doctors constitute just one subspecialty within the broader umbrella of internal medicine. In Massachusetts--a state with roughly a comparable population to Liberia--there are thousands of doctors, plus perhaps a similarly sized group of PAs whose clinical responsibilities often overlap with doctors. At JFK, one of the central places for residents to be given advanced training, Abraham Borbor and Samuel Brisbane constituted the internal medicine faculty in its entirety. Their loss cannot be so easily replaced. I am sad to have lost a colleague for whom I had much affection. But I am devastated for the future of Liberian medicine. Their loss will reverberate for a generation. Thank you so much for posting this. I knew Dr. Borbor when he was a resident in Moshi in about 2005, and his gift for medicine and his absolute commitment to his patients were crystal clear even then. I was so sad when I saw in the NYTimes that he had died, in circumstances which were such an obvious and heart-breaking reflection of his dedication. Your tribute reminds me again of his vitality, and of how much he did accomplish in the time he had. The medical establishment in the US and Europe should accept the challenge of contributing to the construction of health care capacity in Africa, including developing the medical talent from within the continent, so that future crises will not utterly devastate the hospitals of cities like Monrovia.